I’ve never really understood why some people get so squeamish about black pudding. I know, I know – it’s blood, back fat and barley – but surely that’s no more upsetting than the gubbins that goes into a standard sausage? Dr W encourages me to mention a chitterling and tripe-tastic andouillette he ate in Paris once, which, he claims, “tasted of bums”. Black pudding is infinitely nicer. My suspicion is that people recalling cut lips imagine black puddings to taste bloody and metallic. These flavours are absent from a black pudding, which is actually deeply savoury, delicately spiced (especially if you get your mitts on a particularly good one, like these from Bury in Lancashire), and, cooked properly, has a wonderful texture: crisp, sticky and crumbling all at once. The Bury black pudding is, for my tastes, the most reliable and delicious you’ll find in the UK, and many butchers and supermarkets all over the country carry them – you can also order them online from the makers. (At a supermarket, you’re more likely to find one on the deli counter than the butchery counter.) They’re seriously, seriously good; porky, plump and gorgeously spiced. The recipe is a secret, but apparently there’s pennyroyal, fennel and all kinds of other good stuff in there. Do try to go out of your way to find a couple for this recipe. Chop the potatoes without peeling them into 1½ cm dice, and slice the shallots into rounds. Fry over a medium flame in a large pan using two tablespoons of the bacon fat, turning frequently, until golden (about 20-25 minutes). Ten minutes or so before the potatoes are ready, fry the peeled, halved black puddings in the remaining bacon fat for five minute on each side. While the potatoes and black pudding are cooking, put the peppers under the grill, turning every few minutes, until the skins are blackened. Put them straight into an airtight plastic box and seal with the lid while you prepare the other ingredients. The steam from the peppers will help to release the skins. Peel the peppers after five minutes in the box, discarding the skins and reserving any juices. Halve them and slice into strips. Chop the apple into small dice and make up the vinaigrette with the vinegar, honey, walnut and grape oils and any juices from the peppers, with a small pinch of salt. Stir through the apple and thyme and set aside. When you are ready to put the dish together, stir the peppers into the hot potatoes. Now, normally I abhor the chi-chi “towers of things on a plate” thing, but this is a recipe it suits well. So get out a large pastry cutter to use as a template, and pile the potato mixture onto a plate. Use a sharp knife on a chopping board to dice the black pudding roughly and heap it on top of the potatoes. Top with a handful of salad and spoon the apple dressing over the top. Serve immediately. I seem to be having a bit of a thing about chorizo at the moment. Blame this never-ending winter – a hot blast of smoke, paprika and garlic is surprisingly uplifting when it’s this steadily grim outside. Preheat the oven to 200°C (450°F). Use your hands to rub the olive oil into the skins of the potatoes, and dredge them with plenty of flaky salt. I used smoked Maldon salt, which marries nicely with the other smoky flavours in this dish. Bake the potatoes for an hour and a half. While the potatoes are cooking, chop the chorizo into small pieces and fry them in a dry pan until the fat is running. Set aside. Chop and grate the other ingredients. When the potatoes are ready, slice them in half and, holding the potato in an oven glove, scoop out the flesh into a mixing bowl. You’ll be left with a nice little potato-skin cup. Stir the cheeses (reserving a little cheddar to sprinkle over the top), shallot, garlic, parsley and paprika into the fluffy potato with a large pinch of salt, and when everything is well-mixed, stir in the chorizo and its fat. Pile the mixture back into the potato skins, and top with the reserved cheese. Return the filled skins to the oven for another 20 minutes, until golden brown on top, and serve piping hot. I thought I’d missed the Seville orange season, which only lasts for a couple of weeks and starts around the end of January. I’d gone to the market in Cambridge last week, only to find they’d run out. Happily, another box turned up on Saturday, so I snapped up a couple of kilos. Seville oranges are an unprepossessing fruit, knobbly and scarred-looking, and very puny when held beside the majestic, sterile, navel oranges in the next crate. But Sevilles sell out quickly for a reason. They don’t just make gloriously bitter, perfumed marmalade; they’re also a wonderful addition to recipes anywhere you might use a lemon, with their tart, fragrant juice. Making your own marmalade is time-consuming; you’ll need to set the best part of a day aside for the project. It’s worth the effort, though – and my realisation that 14 jars of amber, jewelled preserves only cost me £7 (£3 for the oranges, £4 for the sugar) has left me full of self-righteousness. It’s also a great pleasure to be able to manage the recipe yourself so you can produce your preferred thickness of peel and syrupyness. I like a dense, thick-cut marmalade, of the sort that you just don’t seem to be able to buy these days. (So does my lovely Dad, whose name is on several of these jars.) A home-made marmalade, as you’ll know if you’ve ever had one, is much, much tastier than the shop-bought version. I am a purist when it comes to marmalade, and believe it tastes its best when it’s made with Seville oranges, sugar and nothing else. You’ll find no additions of grapefruit, whisky or ginger here – if you want whisky with your marmalade, pour yourself an accompanying glass. Get out your jam pan, and simmer the oranges in the water for 2 hours with a lid on. Remove the fruit from the liquid and slice the oranges in half. Use a fork (and a friend with a fork if you want to get this done quickly, because this is a somewhat tiresome job) to remove the seeds from the centre and put them in a bowl. Put the now seedless pulp from the oranges in another bowl with any juice. Put all the seeds in a small pan, cover with water and boil vigorously to release the pectin in them for ten minutes while you prepare the skin. You’ll be left with a pile of orange-skin shells. Chop them by hand to your preferred width – some prefer a very finely shredded peel. I like whokking great chunks. Combine the chopped peel with the pulp and put it all back in the water you simmered the whole oranges in with the sugar. Strain the seeds out of the little pan and add the resulting liquid to the marmalade. Bring the marmalade, stirring initially to dissolve the sugar, to a rolling boil, with the lid off. After 15 minutes, dollop a teaspoon onto a cold saucer. Blow on it until it is cool and give it a poke with a finger to test the set. It probably won’t be ready yet – you’re looking for a wrinkly surface skin and a lovely amber colour. Test every 15 minutes. When you judge the set to be right (50 minutes/1 hour usually seems to be about right for a thick cut; shredded skin will come ready earlier) remove the pan from the heat, skim any scum off with a slotted spoon to prevent cloudiness, and pour into sterilised jam jars. I was, I’ll admit, a bit nervous about the restaurants in Miami. A couple of American friends had told me that they found the food in Florida “unsophisticated” and “boring” – thankfully, this really wasn’t my experience. (Outside the Disney parks, that is, where you will drive yourself mad trying to find something to eat that isn’t a pretzel, a sausage of some sort or a funnel cake.) 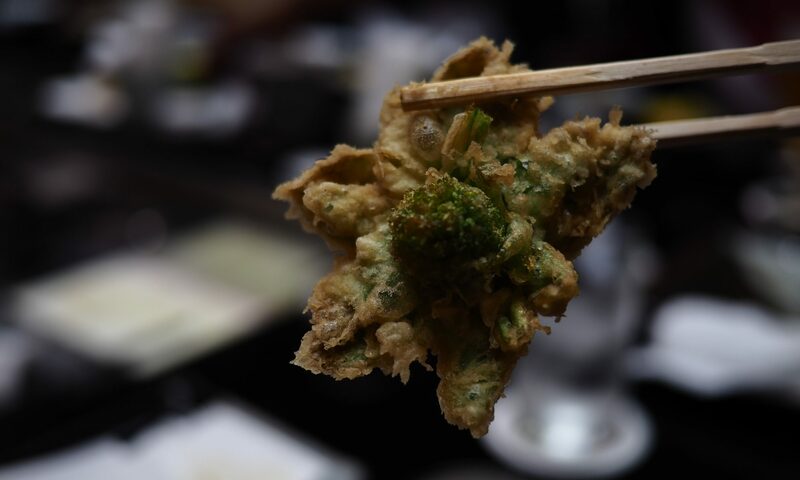 We found some really interesting, innovative eating in and around Miami – traditional American at Michael’s Genuine, some great tapas with a very individual twist at Sra. Martinez and a simply astonishing bento box at Naoe, which I’ll give its own post later on. 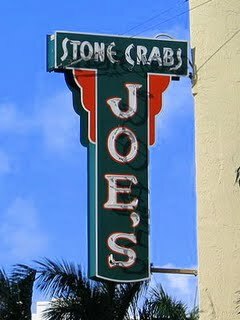 Joe’s Stone Crab isn’t exactly innovative, having been serving up the same stuff for nearly a hundred years, but it came highly recommended by almost everybody we spoke to. At the southern end of Miami Beach, it’s easy to spot by the long line of Aston Martins and Ferraris queuing for the valet parking. The restaurant does not accept reservations. Your best bet is to visit mid-week, or you’ll be looking at a two-hour wait for a table. We went on a Thursday lunchtime, and were shown to a table indoors straight away; there was a 30-minute wait for an outdoor table. Joe’s started out in 1913 as a seafood shack. It really came into its own in the 20s, when Joe Weiss discovered that the local stone crabs, previously passed over as inedible, had enormous, sweet, meaty claws. No, I have no idea how such a thing as a crab with giant claws might have come to be ignored by restaurateurs either, but that’s the story. These days the place only opens in stone crab season (late October to May), and then offers a reduced service until August. The crab claws are still served cold with the original accompaniments: a sharp, mustardy mayonnaise, a vinegary fresh slaw, hash browns and roasted tomatoes or creamed spinach. There’s also a large menu of other seafood, alongside fried chicken and steaks for the fish-phobic. Despite those cars outside, the remarkable bling encrusting a lot of the women diners and the flotilla of designer labels, you don’t have to spend a fortune here, although some care in ordering is required. At lunchtime, the restaurant is offering a recession-busting “Great Lunch Bailout” menu, with a coleslaw starter, three enormous crab claws (trust me – these are so rich you won’t want any more), a positive Everglade of garlicky creamed spinach, a big patty of skillet-fried hash browns, the mustard mayonnaise, drawn butter, a slim slice of key lime pie and a coffee. The whole lot rolls up at $29.95. I decided to embrace my status as a tourist, and wore the proffered bib. I’m very glad I did – the claws are ready-cracked, but I still managed to spray us both with liberal amounts of butter and crabby juices. A polite notice informed us that the recent cold weather (so aberrant that nobody in town seemed able to talk about anything else for the week we were there) meant that the meat from the claws may stick to the shell. It didn’t, but this is still a messy eat. There’s more here than you’ll be able to eat; be careful to save some room for the excellent pie. The crab is the main event here, and it’s downright fabulous – dense, sweet, rich and full of meat. It’s such a simple meal that I find I’ve little else to add. Head over if you have the chance to visit this gorgeous, sunny city, and don’t bother exploring the rest of the menu. These crabs are something you won’t find outside Florida, and they’re a local delicacy so good that you’d be cheating yourself if you didn’t snap up a few claws while you’re there.